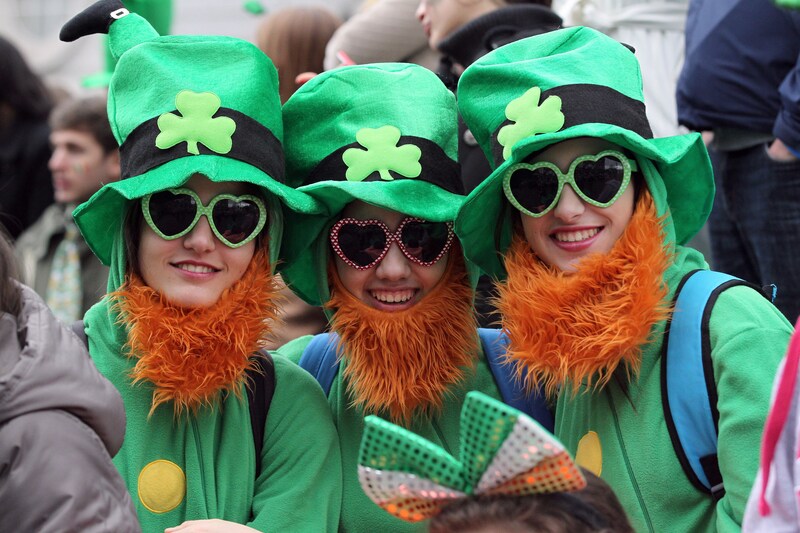 Everyone knows that Chicago's green flowing river, New York City's extravagant Irish parade, and Boston's overflowing bar scene make them three of the liveliest cities to be in on St. Patrick's Day. However, despite all the hype that America's larger cities get on this day of drinking beer and pinching people, there are a handful of surprising St. Patrick's Day party spots around the country that deserve an honorable mention. These eight hot spots may not be the first places you think of when planning out a St. Paddy's Day celebration, but that doesn't mean that they aren't a good time. These different cities range in size from a meager 2,000 people to hundreds of thousands of revelers, but no matter what the city's population, it's likely to grow exponentially on the beloved holiday of St. Patrick's Day. Whether you're looking for a small town or a packed metropolis on this day of all things Irish, there's a lively party spot for everyone on this list. Now get excited to drink green beer and dress like a leprechaun — after all, you can't really get away with it any other day of the year. If you can't make it to NYC, Boston, or Chicago, these lovely destinations are the next best thing. With a name like Shamrock, it's really no surprise that this tiny town in North Texas quadruples in size on St. Patrick's Day and gets a little crazy. The town's holiday festivities run for a total of four days, including a parade, carnival, and 5K run amongst other events. Adding to the excitement, Shamrock names a Miss Irish Rose, and hosts an undeniably tasty chili cook-off. Savannah is known to have some soul, and for that reason alone, it's bound to have the perfect partying attitude on any day of the year. But on St. Patrick's Day, things get especially rowdy. Celebrating the holiday since 1825, the famous city parade draws in gigantic crowds, and dying the public fountains green is a favorite pastime. Dublin, taking its name from one of Ireland's most famous cities, is filled with Irish pride all year long — and St. Patrick's Day is certainly no exception. The city's parade stretches for miles and starts early, beginning at 11 a.m. Continue the day by exploring the Historic District, where you can have your fill of Irish eats, music, and of course, drinks. New Orleans doesn't just know how to have a good time during Mardi Gras. In fact, it's kind of an expert at giant celebrations for every holiday. NOLA also doesn't settle for just one parade celebrating St. Patrick's Day — oh no, it has six! The city also hosts two blowout block parties and hands out ingredients to make homemade Irish stew. Does it get any better? Kansas City begins its parade with a lone piper leading as the streets begin to fill with floats, performers, and musicians. Participants of this parade are especially known to go all out, thanks to a prize system set in place by the city that gives out two tickets to Ireland for first place winners. After the parade, everyone heads to the historic district to drink up. New London may seem like a quiet town, but not on St. Patrick's Day. While the town's population only rings in at 6,000, it throws a party big enough to compare to some of the largest metropolises. Celebrations persist all week long, and along with the town's rambunctious parade and Irish Fest, the town actually changes its name to "New Dublin" during the week. You may have never even heard of Emmetsburg, but this petite town of 7,000 doubles its size for St. Patrick's Day. Filled with activities throughout the day that include a fish fry, chainsaw art, and a half-relay, the night only gets more rowdy as the bars get packed and the beer starts flowing. Oh, and did I mention there's a baked potato bar? Sold. Scranton is another small town that knows how to do things right on St. Paddy's Day. The usually mellow city overflows with visitors during the holiday, boasting a parade that has more than 8,000 marchers and performers. To further entice, this celebratory parade is considered the second largest in the nation... impressive.